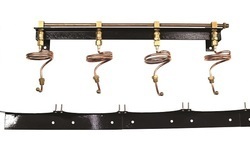 Our product range includes a wide range of middle frame with chain, manifold point with nrv and tailpipe, manifold nrv and copper tailpipe. The manifold manufctured by us are extendable & Non-extendable type with choice of size of cylinders bank for bulk 'D' type jumbo cylinders. Manifold is suitable to withstand a working pressure of 140kg/cm3.